Discover ergonomic excellence in all mesh office chairs. ergoCentric tCentric Hybrid features breathable mesh back with airless cushion technology for exceptional comfort. The tCentric Hybrid is equipped with Synchro Glide mechanism, which is ideal for reclining or upright sitting posture. Controls on this chair are easy to reach and simple to adjust. This tCentric model is equipped with modern armrests, which offer height and 360 swivel adjustability. Customize ergoCentric tCentric with options including tCentric Lumbar support, Lumbar support with Air Lumbar, Tailored adjustable headrest, and your choice of lift (seat height) and casters. ergoCentric tCentric Hybrid Office Chair is made to order and ships in 3 weeks. 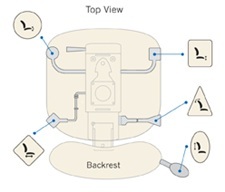 Lumbar support and chrome accent casters shown in the tCentric image are optional. • Synchro 2:1 ratio. 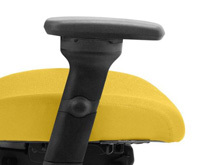 The seat and back are linked and tilt simultaneously as you lean back with a ratio of two degree in the back for every on degree of seat pan tilt. The ergoCentric headrest can be adjusted to exactly where you need it. weights: 21" (350 lbs), 24" (450 lbs), 30" (750 lbs). Click the button below to add the tCentric Hybrid All Mesh Ergonomic Office Chair By ergoCentric to your wish list.